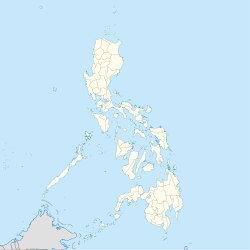 Palo, officially the Municipality of Palo, is a 3rd class municipality in the province of Leyte, Philippines. According to the 2015 census, it has a population of 70,052 people. The municipality is the seat of most government departments, bureaus and regional offices of Region VIII, although some are situated at the neighboring city of Tacloban. The town is also home to the offices of the ecclesiastical government of the Archdiocese of Palo; the archbishop's residence; as well as the secondary, tertiary and theology seminaries of the archdiocese. The municipality is located in the north-eastern part of the province of Leyte, 8 miles from the capital city of Tacloban. The discovery of the advancing communities of Palo dates back to the early 16th century A.D. along the banks of Bangon River. However, local historians believe that the settlement of Palo started as early as the 10th to 13th century A.D.. The first known settlement were the kingdom of Takuranga, first name of Palo under King Guban, and the Kingdom of Kaluugan, the second name of Palo under King Pitik. From the 14th to the 16th centuries, some other settlements were formed which also became the succeeding names of Palo, until finally in 1550 Don Miguel Lopez de Legaspi coalesced the settlements and named the new confederation "Palo". The other settlements were Kasangitan, Binangalan, Kasuguran, Bunga, Bangon and Guindapunan. The settlers of Bunga played a vital role in the history of Palo, having formed the settlement of Bangon which is now the town center. Palo formally became a town in 1768 with Kapitan Balasabas as its first administration. Accordingly, the early settlers of Palo were the clans of Panganuron, Kadampog, Manlangit, Kumago, Kawaring, Kabalhin, Kumagong, Maglain, Bilyu and Dilyu. Palo is considered to be one of the most historical towns of Leyte. It is well known as the site of Gen. Douglas MacArthur's return to the Philippines together with Philippine and American military forces after a period of exile in 1944. Hill 522, a hill located near the town center, was the site of fierce fighting between Allied and Japanese forces during the Second World War. The metropolitan cathedral of the archdiocese, located right across Palo's municipal hall, was used as a hospital for wounded Filipino and American forces. A memorial now stands at the beach site where MacArthur and his troops landed, locally known as the MacArthur's Park. The first Gabaldon Building is also situated in Brgy. San Joaquin Palo, Leyte. It was inaugurated by President Sergio Osmeña. Palo was also once the capital of Leyte. The town's Purissima Bridge was the first steel bridge built in the province. In 1957, sitio Campitic was converted into a barrio, while barrio Baras-Candahug was divided into two: Baras and Candahug. Barrio Malirong was renamed as Libertad. On November 8, 2013, Palo was severely struck by Typhoon Haiyan (Yolanda), which destroyed a large portion of Eastern Visayas and killed a number of residents in the town. On January 17, 2015, Pope Francis visited the town as part of his papal visit to the Philippines to meet with the surviving victims of the typhoon. He also blessed the Pope Francis Center for the Poor and met with priests, seminarians, other religious figures, and surviving victims of the typhoon at the Palo Cathedral before leaving Leyte. Long before the arrival of the Spaniards, a village situated along the northeastern part of Palo was already a thriving community. Its tribal chief was Kawaring, a brave yet peace-loving ruler who propelled his people to engage in agriculture. He was likewise respected and loved by his people such that when the Spaniards eventually came to the village and asked for its name, the natives enthusiastically replied, “KAWARING”, presuming that the Spaniards were asking for their ruler. Due to miscommunication, the name was distorted and the place became known as PAWING. Pawing was mainly an agricultural community made possible by fertile lands and sufficient water supply coming from the Pawing creek. World War I broke out and due to in-migration in 1898, mat weaving was introduced. The new settlers occupied the southern portion of the village and they produced enormous quantity of mats, hence the name PABRIKA. The area near the bridge was called MAY-TULAY, and the northern portion was called MOHON to emphasize the boundary between Pawing and Marasbaras. The first public building to be constructed was the school which offered two grades in 1914. After a couple of years, the school was closed down to make way for the national highway. Modernization has affected the once-agricultural village. Pabrika had to be phased out to accommodate the government center. Residents had to be relocated and more families settled in an area along the irrigation canal, hence the name DIKE. Nowadays, Pawing is a semi-urban community with numerous government offices that grace the place. Nevertheless, the resiliency of the people to cope with change has not marred their cultural heritage that is purely PAWINGNON. In the 2015 census, the population of Palo, Leyte, was 70,052 people, with a density of 320 inhabitants per square kilometre or 830 inhabitants per square mile. Literacy rate in Palo is 99.5%. The town's native language is Waray-Waray, the major language and lingua franca in the Eastern Visayas region. Palo is the seat of the ecclesiastical province, the Archdiocese, where the Roman Catholic Archbishop resides in Bukid Tabor. One can find the Metropolitan Cathedral in Palo. Also, the seedbed of vocations to the priesthood is found at the Sacred Heart Seminary and the St. John the Evangelist School of Theology. Two Paloan nuns were also Superior Generals in their respective congregations. To date, there are 79 ordained priests and 106 nuns from the town alone. Palo is the seat of the 6.8-hectare Leyte Information and Communications Technology (ICT) Park and the 22-hectare Leyte Mikyu Economic Zone. The Leyte ICT Park hosts two BPOs while the Leyte Mikyu Ecozone is undergoing development. The town is very active in commerce and in tourism. It attracts a significant number of tourists every year. The town also has its historic Municipal Building which was the former Seat of the Provincial Government of Leyte. Its location is conducive to and ideal for trading and commerce. The main source of income for most of the citizenry is the buying and selling of farm products and the production and fermentation of the local coconut wine "tuba". Guinhangdan Hill, a destination of Holy Week pilgrims. The hill is now a forest reserve. Red Beach - The landmark that has brought Palo to the annals of world history is the Red Beach, in barangay Candahug, where Gen. Douglas MacArthur first landed to liberate the Philippines from the Japanese occupation on October 20, 1944. ^ a b "Province: Leyte". PSGC Interactive. Quezon City, Philippines: Philippine Statistics Authority. Retrieved 12 November 2016. ^ a b "Leyte Landing". Official Gazette of the Republic of the Philippines. Retrieved 25 January 2015. ^ Misagal, Monch Mikko E. (16 October 2014). "Did MacArthur land on Leyte before Oct. 20, 1944?". Manila Bulletin. Retrieved 25 January 2015. ^ "R.A. No. 1722: An Act Converting the Sitio of Campitic in the Municipality of Palo, Province of Leyte, into a Barrio to Be Known As the Barrio of Campitic". LawPH.com. Retrieved 2011-04-12. ^ "R.A. No. 1723: An Act Creating the Barrios of Baras and Candahug in the Municipality of Palo, Province of Leyte". LawPH.com. Retrieved 2011-04-12. ^ "R.A. No. 1740: An Act Changing the Name of the Barrio of Malirong, Municipality of Palo, Province of Leyte, to Libertad". LawPH.com. Retrieved 2011-04-12. ^ "Tacloban City: Hundreds Dead in City and Leyte Province After Typhoon". Epoch Time. Retrieved 2013-11-11. ^ "Pope Francis arrives in Leyte to console Yolanda victims". Rappler. 17 January 2015. Retrieved 17 January 2015. ^ Census of Population and Housing (2010). "Region VIII (Eastern Visayas)". Total Population by Province, City, Municipality and Barangay. NSO. Retrieved 29 June 2016. ^ Censuses of Population (1903–2007). "Region VIII (Eastern Visayas)". Table 1. Population Enumerated in Various Censuses by Province/Highly Urbanized City: 1903 to 2007. NSO. ^ "Province of Leyte". Municipality Population Data. Local Water Utilities Administration Research Division. Retrieved 17 December 2016. ^ "DOST Eyes Palo, Leyte as Country's Coco Wine Capital". Interaksyon.com. Philippines News Agency. 1 July 2013. Retrieved 25 January 2015. ^ "Boosting Philippines' Coconut Wine Industry". Tempo. 20 July 2013. Retrieved 25 January 2015. Wikimedia Commons has media related to Palo, Leyte. Wikivoyage has a travel guide for Palo, Leyte.